How would you like a nice Chinese gourd? One that's shaped like Chairman Mao? Or, how about Jesus? Xie's gourds are grown without any pesticides, which mean that many of them perish. The gourds come in a variety of shapes, ranging from Jesus to the God of Fortune and from Chairman Mao to, even, Santa Claus. 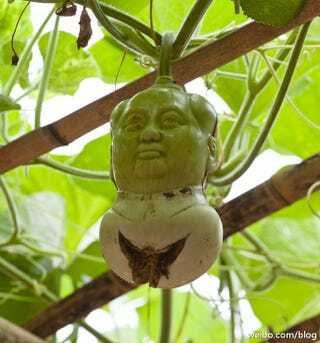 So, yeah, not all of the gourds look like Mao! And not all gourds in China look like this, so don't think that. These are special gourds. The vegetables are grown into a plastic case, giving them their shape. In China, gourds are associated with good luck and money. They are also assorted with various deities. They're highly auspicious! So, there is a tradition of painting images on gourds. These shaped gourds are an evolution of that tradition.